The Lotus Pet Food Company follows the tagline, “natural food for pets,” and that is exactly what they provide. This company understands the importance of quality nutrition for pets which is why they follow a holistic approach to pet nutrition, creating healthy and delicious products that nourish your pet’s body from the inside out. All of their recipes are made with ingredients sourced from North America and New Zealand and cooked in small batches to ensure quality and nutritional integrity. This brand focuses their recipes around high-quality meats, whole grains, wholesome fruits and veggies, and a special oil blend. Every one of Lotus’ recipes is complete and balanced, exceeding the minimum nutritional requirements for pets in all life stages. If you are looking for a high-quality brand for your dog, consider their foods as an option. The Lotus Pet Food Company was founded by a group of pet lovers who run a pet retail store chain called Centinela Feed and Pet in Los Angeles, California. As more and more of their favorite manufacturers turned to extrusion for their products, the group decided to create their own brand of wholesome, baked food. The first Lotus Natural Dog Food hit pet store shelves in 2003 and the brand has continued to grow in the years since its release. Their Company remains a family-owned and -operated company to this day. Lotus Pet Food is a family-owned and -operated company that designs, produces, and manufactures all of their own pet foods. The company produces their dry products in a family-owned and -operated bakery in Canada and their wet foods are made in their new micro-cannery located in California. They makes their food in small batches without artificial additives or preservatives and they are committed to ensuring the quality and safety of their products. The Lotus website states that all of their ingredients are sourced from North America (the United States and Canada) with the exception of three ingredients. They source their green mussels, deboned lamb, and lamb meal from New Zealand. Not only are they dedicated to using only the best ingredients, but they follow strict standards for safety and quality as well. The Lotus Company does not use any corn, wheat, or soy ingredients (aside from soy oil which is not harmful for pets) and they use healthy whole grains in many of their recipes (except for the grain-free options). They also uses premium-quality proteins and healthy fats for nutritional balance and optimal flavor. The Lotus Company is very careful about where they get their ingredients, how they formulate their recipes, and the way in which their products are cooked. Their dry food products are baked in small batches, not extruded like traditional kibbles. Their wet food products are made in a company-owned micro-cannery, also in small batches to ensure quality. With all of these things in mind, it should come as no surprise for you to learn that they have not been affected by any recalls to date. Lotus products can be found in specialty pet stores and you may also be able to purchase them from online retailers. They occasionally offer monthly deals to those who sign up on the website with their email address – you also get a coupon for 2 free cans when you sign up. You may also be able to find Lotus dog food coupons from individual retailers as well. The Lotus brand is more expensive that most traditional kibbles on the market for a number of reasons. For one thing, their dry foods are baked, not extruded, and all of their products are made in small batches, often with organic ingredients. Because their foods are so high-quality, you should expect to pay a little more for them. The price for a 20-pound bag of their dry food ranges from about $72 to $135, depending on the recipe. Smaller 10- and 12.5-pound bags of Lotus dry food cost $35 to $70. You can purchase 5.5-ounce cans of their wet food in cases of 24 for $65 to $95, which gives you an average price around $3.30 per can. The Lotus Company offers four different lines of products – Raw, Oven-Baked Dry, Canned Stew, and Canned Just Juicy. All of their pet food products are designed in keeping with a holistic approach to pet nutrition so you can rest assured that each recipe is made with all of the healthy nutrients your dog needs and nothing he doesn’t. They don’t just focus on the nutritional value of their products either – they are also dedicated to making their foods as delicious and irresistible for pets as possible. Both you and your dog are sure to love their products. Raw Products: When it comes to their raw products, Lotus currently only offers one recipe. This recipe features chicken as the main ingredient and it is supplemented with a number of organic fruits and vegetables as well as a blend of omega oils. It comes in 30-pound and 6-pound bags, offering a minimum 14% crude protein and 10% crude fat with 73% moisture. No matter which recipe you choose, you can rest assured that Lotus Pet Foods are made with the freshest, most high-quality ingredients around. All of their ingredients are sourced from North America and New Zealand, plus every recipe is tried and tested to ensure quality and safety. They don’t use any artificial colors, flavors, or preservatives in their recipes and they don’t use any corn, wheat, or soy proteins either. All of Lotus’ products are prepared in small batches with plenty of natural flavor so both you and your dog will love them. This Lotus Oven-Baked Chicken Recipe Dry Food is available in Regular Bites and Small Bites so you can choose the size that works best for your dog. This recipe is oven-baked to preserve the nutritional integrity of the raw ingredients and it is prepared in small batches to ensure quality and safety. Made with natural chicken, whole brown rice, wholesome fruits and veggies, and a healthy blend of fats, this recipe is complete and balanced for adult dogs. It also contains plenty of natural flavor- your dog won’t be able to resist it! The first ingredient in this recipe is chicken, as promised – it is followed by chicken meal. This combination of ingredients is highly beneficial for two reasons. For one thing, chicken is a high-quality source of animal protein that contains all the essential amino acids your dog needs. Second, the combination of fresh chicken and chicken meal ensures that the volume of protein in this recipe doesn’t change much during cooking. Even though they bake their products instead of extruding them, some of the original moisture content is lost which means that fresh meats like chicken that contain up to 80% moisture by volume, may reduce in volume during cooking. Chicken meal, however, is already cooked to remove moisture so it is a highly concentrated source of protein. After the chicken and chicken meal come several sources of carbohydrate – whole ground rye, whole ground brown rice, ground barley, and oatmeal. All of these are whole grains and thus they are easily digestible for most dogs. The only exception is for dogs who suffer from grain allergies or sensitivities. These ingredients provide usable energy as well as dietary fiber and essential nutrients. This recipe also contains supplementary sources of fiber like pea fiber, flaxseed, and fresh fruits and vegetables. The fresh fruits and veggies serve primarily as natural sources for key vitamins and minerals, but they do contain fiber as well. The crude fiber content of this recipe is 4.5% which is a good amount. The remaining ingredients in this Lotus Oven-Baked Chicken Recipe Dry Food consist primarily of fats and supplements. The main source of fat in this recipe is soybean oil and it is supplemented with both olive oil and salmon oil. These oils work together to provide a balance of omega-3 and omega-6 fatty acids to support your dog’s healthy skin and coat. In terms of supplements, this recipe includes vitamins as well as minerals and many of the minerals are chelated – this means that they have been chemically bound to protein molecules which makes them easier for your dog’s body to digest and absorb. There are also dried fermentation products which act as probiotics to support your dog’s digestion. This Oven-Baked Chicken Recipe Dry Food is formulated to meet the nutritional levels established by the AAFCO Nutrient Profiles for adult maintenance. Overall, this Oven-Baked Chicken Recipe Dry Food provides high-quality nutrition as well as plenty of natural flavor. This recipe starts off strong with both chicken and chicken meal as high-quality sources of protein, not to mention the pollock and egg that appears later. For carbohydrates, this recipe includes several whole grains which are generally digestible for dogs – they may cause a problem for dogs that have grain allergies, however. The main source of fat is plant-based, though salmon oil is used as well, but the recipe is filled out with a number of beneficial supplements including chelated minerals and probiotics. This Turkey Stew Recipe Canned Food recipe is a simple recipe made with premium-quality ingredients and loaded with natural flavor. Because this formula is appropriate for all life stages, you can feed it to puppies as well as adult and senior dogs. This formula is naturally grain-free as well which makes it a good choice for dogs that suffer from food allergies or sensitivities. Adult dogs can be fed ¾ to 1 can per 10 pounds of bodyweight and puppies should be fed up to twice that amount. Just keep in mind that this formula is nutrient-dense (with 384 calories per can) so be careful to avoid overfeeding. 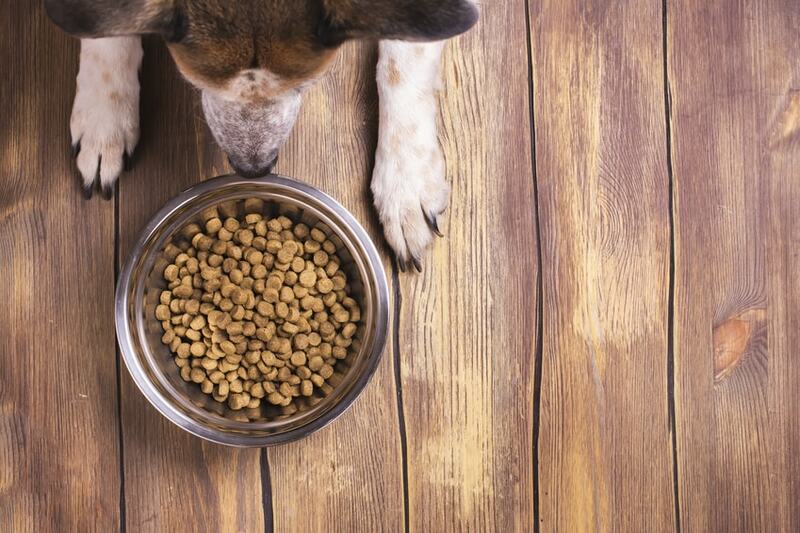 You can use this food as your dog’s staple diet or as a supplement to kibble – just keep an eye on your dog’s bodyweight and condition and make adjustments to his diet as needed. This recipe features fresh turkey as the main ingredient, followed by turkey broth. Together, these ingredients provide a crude protein content of 10% (which translates to a dry matter value of 50%) as well as moisture and natural meat flavor. For carbohydrates, this recipe relies on potato starch, baby carrots, blueberries, sweet potatoes and whole flaxseed – there are also some other supplementary fruits and vegetables. The total fiber content of this recipe is 0.5% which translates to a dry matter value of 2.5% which is well within the recommended range for dogs. Ideally, dog food should contain no more than 5% dietary fiber because too much fiber in a dog’s diet can cause digestive problems. The right amount of fiber, on the other hand, can support your dog’s healthy and regular digestion. The remaining ingredients in this Turkey Stew Recipe Canned Food recipe consist primarily of fats and supplements. The main source of fat used in this recipe is chicken fat, a highly nutritious source of animal-based fat. Chicken fat is a great ingredient because it contains plenty of nutrients and, because it is animal-based, if offers excellent bioavailability. This ingredient is supplemented with olive oil and salmon oil to help ensure a balance of omega-3 and omega-6 fatty acids. The remaining ingredients are made up of chelated minerals and vitamin supplements. This recipe could benefit from some probiotics, but it is good to see that it is made without carrageenan, guar gum, and xanthan gum. Carrageenan is a particularly questionable ingredient that may have carcinogenic effects on pets. This Turkey Stew Recipe Canned Food is formulated to meet the nutritional levels established by the AAFCO Nutrient Profiles for all life stages. Overall, this Lotus Turkey Stew Recipe Canned Food is complete and balanced for all life stages and it is loaded with natural flavor. This formula starts off strong with fresh turkey as the main ingredient and it is cooked in turkey broth for moisture and flavor. This recipe doesn’t contain any of the usual thickeners like guar gum and carrageenan, plus it relies primarily on fresh fruits and vegetables for dietary fiber and carbohydrate. With chicken fat as the main source of fat and olive oil and salmon oil to supplement it, this recipe provides a balance of omega fatty acids and the nutrient supplements included at the end help to ensure balanced nutrition. All in all, any dog would be lucky to enjoy this Lotus Turkey Stew Recipe Canned Food.